METALLICA will embark on a European tour in May. The three-month trek will cover 25 cities and 20 countries and include “black tickets, enhanced experiences, free albums and downloads, and more,” according to a press release. 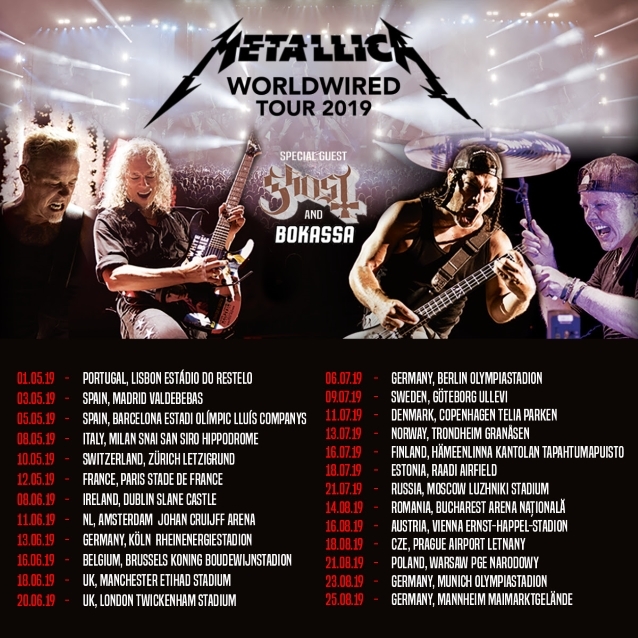 Grammy-winning, Swedish rock band GHOST will be special guest on all four European legs of METALLICA‘s 2019 “WorldWired” stadium tour that begins on May 1 at the Estadio do Restelo in Lisbon, Portugal. GHOST has shared festival stages with METALLICA before, but this is the band’s first invitation to join METALLICA on tour. With Norway’s BOKASSA opening all dates, the three-band bill will play 25 stadiums from May through August. Fan-club presales begin tomorrow (Tuesday, September 25) at 10 a.m. CEST for Legacy Members and 11 a.m. CEST for Fifth Members. Tickets will go on sale to the general public starting at 10 a.m. local time on Friday, September 28. METALLICA recently landed on Pollstar‘s Global Concert Pulse chart with concert grosses of more than $2 million per market appearance on the band’s last European tour. The San Francisco-based metal giants averaged 20,451 tickets per market, at an average ticket price of $104. The 19 market reports included a two-night stand at Stuttgart, Germany’s Hanns Martin Schleyer Halle, which grossed $3.3 million. Both shows were sold out, with an attendance of 14,695 per concert. Although METALLICA played U.S. stadiums in the summer of 2017, the band was mostly indoors for the first leg of its European tour last fall. The 2017 dates on the “WorldWired” tour, which included stadium shows across the U.S., grossed $110.3 million in North America and $152.8 million worldwide.